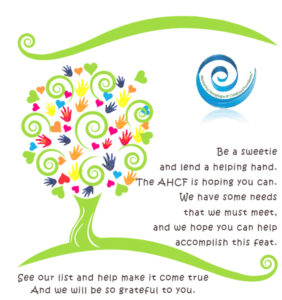 Help us find treatments for AHC, provide information and support to AHC families, and ultimately a cure for Alternating Hemiplegia of Childhood. Make a secure online donation with your credit card or bank card now. Click DONATE above. Increase the Impact of Your Donation: Many corporations match employee donations. Some also have volunteer grant programs where they will recognize your ongoing support by providing AHC Foundation with a financial donation. We are happy to fill out any required forms to help facilitate your donation. Email ahcfoundation@ahckids.org for more information or questions. Below are a variety of ways you can support our mission to END AHC. Would you like to make a donation to Honor an AHC Child or Adult? Read personal stories provided by families about their journey through AHC. Donate in their honor through these Honorariums. Giving Tree: Consider the impact of your donation by reviewing our Giving Tree. Support an event already planned! AHC Families hold fundraisers in every corner of the U.S. throughout the year while working hard to raise funds for research. Fellow AHC families are always welcome! Click here for a list of Fundraising Events. Consider a smaller recurring gift in lieu of one large gift. Simply select a smaller amount and check the recurring box at the Donation page. Do all of your shopping at major retailers through IGive or Amazon Smile. A tribute or memorial donation is a meaningful and hopeful way to honor someone special while supporting the mission of the Alternating Hemiplegia of Childhood Foundation (AHCF). 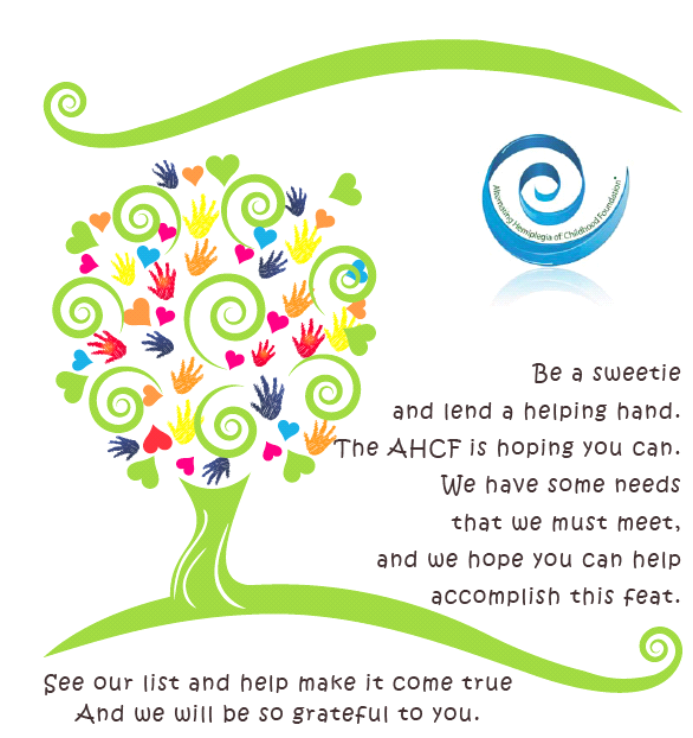 Your help has never been needed more urgently as the AHCF works towards finding the cause and cure for AHC. Tribute Donations can be for a birthday, special occasion, holiday gift, graduation, speedy recovery, or to recognize a person’s good deeds. Memorial Donations are accepted in honor of a deceased loved one. Memorial gifts are a lasting remembrance of a special person you wish to honor. The Alternating Hemiplegia of Childhood Foundation will acknowledge your Tribute or Memorial gift by notifying the family in whose name the gift was made and a receipt will be available to you. (either emailed and printed from an online donation via Neon or if you sent a check you will receive a thank you letter/receipt in the mail. The foundation is grateful that you wish to donate to the AHCF in honor, or in memory, of a loved one. The fastest and easiest way to make your donation is to give online. Clicking the Donate Link will take you to the online donation form. If you prefer to send a check please be sure to include a note indicating the name of the person you are honoring or wish to memorialize, as well as the name and address of anyone who should receive an acknowledgment of your generous donation. If you own stock, it is often more tax-efficient to contribute stock than cash. To learn more, contact AHCF at ahcfoundation@ahckids.org or call our Treasurer Gene Andrasco 847-530-6918. To donate by check or money order, please use this printable mail-in form. Call (313) 663-7772 and have your credit card ready. Alternating Hemiplegia of Childhood Foundation is a 501(c)(3) non-profit, tax exempt organization 501 (c) (3). Federal ID # is 38-3225425. For information regarding income tax deductibility, please contact your tax advisor. For more information regarding donations, please call (313) 663-7772 or email ahcfoundation@ahckids.org.